Having attended the launch of La Roche-Posay - Anthelios XL a month or so ago, I had been meaning to try out some of the products that came within the goody bag. However, this is England, and after a cold, long, dark, long, miserable, (did I mention long?) Winter, the weather has finally picked up which has allowed me to trial the goodies out! All of these products have a high protection against the harmful rays from the Sun, and being rather fair skinned and burning like a tomato at any given chance, I was relieved to see such a high SPF of 50 within each of the products. The Non-perfumed cream designed for comfort felt incredibly soothing upon my skin, and was easily absorbed into my skins pores. The texture felt smooth, and the overall finish felt incredibly light! Compared to the Non-perfumed fluid designed to be Ultra Light, there isn't much that differs between the two, other than the fluid is slightly trickier to apply with it being much lighter in texture, and I would advise you to be rather quick when it comes to application as otherwise it will run everywhere! The Non-perfumed dry touch gel-cream has been designed to create an anti-shine appearance, ideal for those who don't want to appear as though they have been lathered in too much suncream! In terms of the texture, again this was very light upon my skin, but didn't absorb too well onto my skin... Admittedly I have found that in the past I have steered clear from gels, as for some reason, they don't work for my skin type. Needless to say, that doesn't mean it won't work for you! Onto my favourite product out of the Anthelios XL Range, the Invisible fresh mist! Without a doubt, the easiest to apply and despite being a mist and evaporating/absorbing almost instantly, I do forget sometimes I have any sun protection on with this! I also like the fact that it is rather unique and a first for me when it comes to sun protection as before, I mainly stuck to thick, gloopy creams! Overall, a fantastic range from La Roche-Posay and with the weather here in the UK finally picking up, I know my skin will be well protected this Summer! To see the full range of the Anthelios XL, click here for more. Have you tried any of the products from the Anthelios XL range? If so, which ones? Did you find that they protected your skin from the Sun? When it comes to keeping your skin safe in the Summer, what sort of product works best for you? Let me know your thoughts below as I would love to hear from you, and don't forget to click that 'like' button! I recently attended the Launch for La Roche Posay for their latest collection; Anthelios XL! Set on the rooftop of Ham Yard Hotel - London, the rooftop had been decked out with all things Summertime, however the weather couldn't have been further from it. Dull and cold, yet the brightly coloured packaging of the Anthelios XL managed to perk things up! The Anthelios XL Range varies from Suncreams, Sun Sprays, Sun Lotions, Sun Gels and Sun Sticks. Anthelios XL is a sun care range designed for sensitive skin for both children and adults. 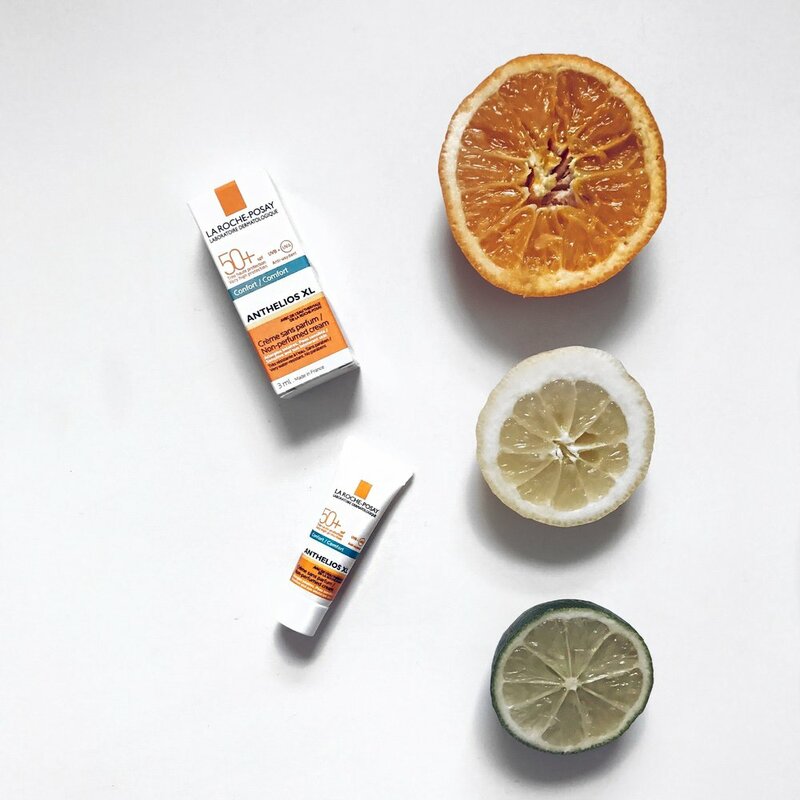 The products within the Anthelios XL Range offers high protection sun care against UVB and UVA Rays which combined, are responsible for 80% of the signs of premature ageing. After taking numerous photographs of the Launch, we were then told we could take away a goody bag depending on our skin type. As my skin-type tends to differ between 'Normal' and 'Oily', I chose the 'Oily' goody bag to see if the products within the bag will help protect my skin this Summer! As the weather here in England is currently abysmal, I haven't been able to trial out the products featured within the bag yet as there has been so Sunshine! So do keep your eye out for an upcoming products review on the Anthelios XL Range I was given. You can view the full Anthelios XL Range here! Have you tried any of the Anthelios XL products before? If so, what have you tried? Have you tried any La Roche Posay skincare products? What are your thoughts? Do let me know what you think, as I would love to hear from you, and don't forget to click that 'like' button down below!